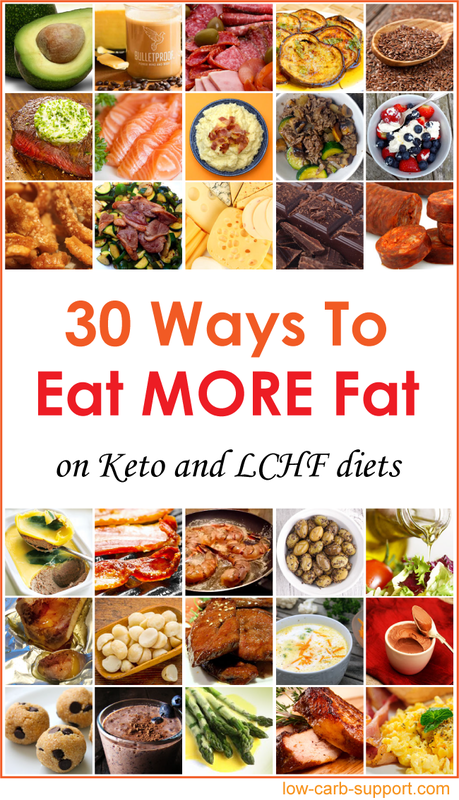 Low-Carb High-Fat Keto Foods List - Crank Up The Fat Macro! So you might unconsciously eat less fat than you need. How much fat is enough? On ketogenic diets, about 70-80% of all calories should come from fat. That’s huge compared to how much fat people get on “standard” diets, let alone on low-fat diets. General public shuns fatty cuts of meat because of the low-fat BS. Good news for us – lower demand means cheaper prices. Supermarkets often trim fat from meat. Find a butcher – either locally or online – and ask them for untrimmed cuts. Choose pasture-raised grass-fed red meat over grain-fed, for better taste and nutrient quality. Examples of fatty meat cuts are pork belly, pork ribs, lamb neck, untrimmed lamb chops, beef short ribs, rib eye steak and sirloin steak. Chicken drumsticks and wings have more fat than breast meat. Roast, slow-cook or fry them for a perfect high-fat meal. Duck breasts have a nice layer of fat under the skin. Many recipes call for scoring the skin to drain some of the fat. Skip this step to retain all the fatty goodness. Duck legs are fantastic when slow-cooked. Obviously, forget the standard diet advice of discarding poultry skin. On Keto, skin is the best part! 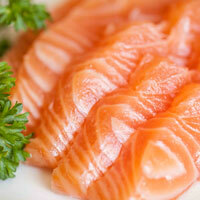 Oily fish is high in fat and healthy omega oils that are essential for your heart health. The best options are salmon, sardines, mackerel and herring. Fresh fish can be expensive, but tinned or frozen fish is just as nutritious. Smoked mackerel is much cheaper than smoked salmon. For tinned fish, go for versions with oil rather than water or brine. So what about leaner cuts of meat? Say you roasted a whole chicken and have lots of breast meat leftover? 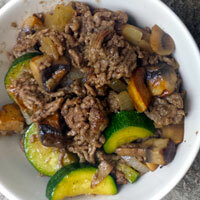 Boost lean meat with a high-fat dressing or sauce. 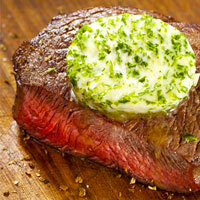 For example: sliced chicken breast with mayonnaise, lean steak with Béarnaise sauce, lean ham with a blue cheese dip. 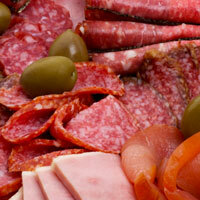 Choose deli meats with higher percentage of fat, like salami, Parma ham, prosciutto, jamon and porcetta. Avoid processed meats as they might be bulked with carbs. Here’s a tip from Italy – drizzle olive oil on a platter or cold meats, cheese and olives. Perfect Keto antipasti starter! Italians know a lot about good meat – it’s not all pizza and pasta. A generous helping of oil-based dressing can turn any boring salad into a scrumptious Keto meal. 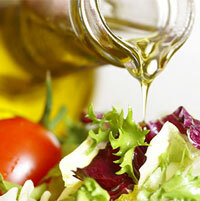 Add oil on its own, or mix with lemon juice or wine vinegar for a simple low-carb salad dressing. Virgin olive oil is good for salads. Avocado oil, walnut oil, flaxseed oil and cold-pressed sunflower oil are all good choices, adding flavour as well as fat. Boiled vegetables are a prime example of bland and unexciting food. Butter to the rescue! 1-2 ounces of butter will transform any tedious boiled vegetable into a wonderful side dish. 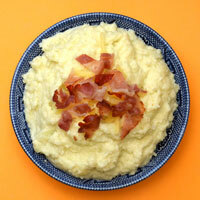 Always add lots of butter to your mashed cauliflower. Pan-frying is a great way to cook fast Keto meals. It works well for almost everything – meat, poultry, fish, seafood and veggies. 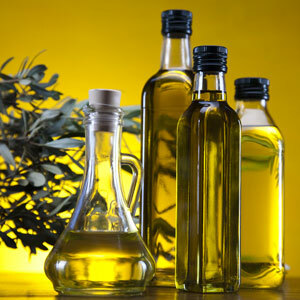 As with salad oils, go for high-quality, cold-pressed oils over cheaper refined versions. Avocado oil, peanut oil and sunflower oil are good choices for high-temperature cooking. Coconut oil and olive oil work well for mid-temperatures. 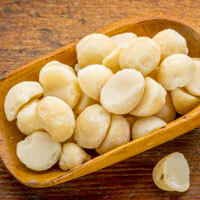 Nuts are naturally high in fat and reasonably low in carbs. The best options are macadamia, Brazil nuts, walnuts and pecans. Avoid pistachios and cashews, as they are much higher in carbs. Nut butters are good for making low-carb desserts, but always check the label to ensure there is no added sugar. Buying nuts in bulk is a bit cheaper than from supermarkets. Hard cheeses (e.g. cheddar, parmesan, gouda, Emmental) are high-fat and almost zero carb. Softer cheeses have slightly more carbs but are still within acceptable Keto range. 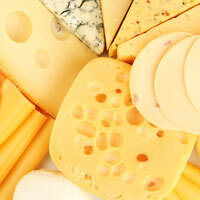 There are so many ways to eat cheese! Have it as a snack or instead of dessert, grate and sprinkle on meals, roast as cheese chips and add to low-carb recipes. You can also pan-fry halloumi cheese, bake camambert and brie, and make low-carb desserts with cream cheese. 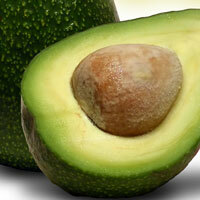 Avocado is technically a nut, packed full of healthy omega-3 fats. It is also high in fibre. Have it on its own as a snack, add to salads, mash it up for a guacamole or even make a sweet mousse out of it. Pure 100% unsweetened cocoa is high in fat, but not that high in carbs. It just gets laden with lots of sugar for mass-market products. If you can avoid the sugar, you can have the chocolate. 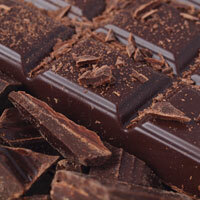 Get sugar-free chocolate, sweetened with Stevia, erythritol, or another low-carb sweetener. Alternatively, buy unsweetened cocoa or 100% cocoa solids baking chocolate, and make your own low-carb chocolate from scratch. There are also plenty of low-carb chocolate dessert recipes. Mascarpone is a type of cream cheese. But it is higher in fat (around 45g per 100g / 3.5oz) and lower in carbs (around 1-3g net carbs per 100g / 3.5oz, depending on the brand). 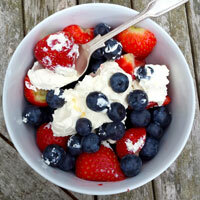 Both mascarpone and cream cheese work wonderfully in low-carb desserts. 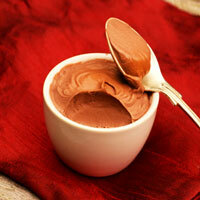 You can just simply add a bit of sweetener, plus cocoa powder or another flavouring for an instant dessert. Crème fraîche is basically a slightly posher version of sour cream. It has more fat than sour cream – about 30-40% fat versus 20-25% fat in sour cream. Add to soups and stews, make dips, use as salad dressing, mix with mustard for a nice meat sauce, jazz up desserts and fresh berries. Add chopped nuts and a bit of sweetener to sour cream for a mock low-carb “granola” yoghurt. 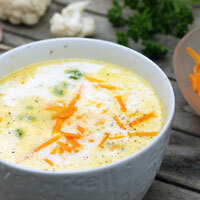 Boost your soups and stews with extra fat – dairy like cream or sour cream, grated cheese and even just butter. Fry your soup ingredients in oil before adding them – that also improves flavour. 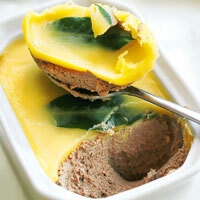 Make your own pate and load it with butter. 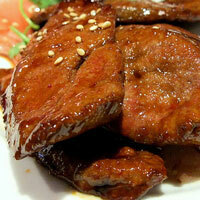 Liver is a traditional ingredient, but you can use any fatty meat instead. Mackerel and salmon also make nice pates. Fat bombs are Keto recipes deliberately designed to deliver a huge amount of fat in one bite. Fat bombs can be either sweet (with sugar substitutes) or savoury. 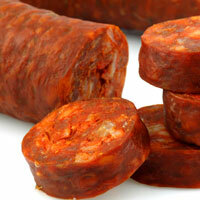 Chorizo is a spicy Spanish sausage with a strong taste. Slice it into thin slices or cubes and add to your fried veggies or mince meat for an instant boost in both fat and pimento flavour. You can basically think of it as a fatty spice! Bacon is carnivore’s candy. 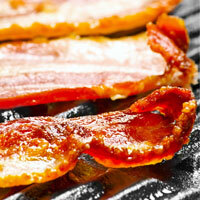 You can pan-fry bacon, grill it or cook it in the oven. 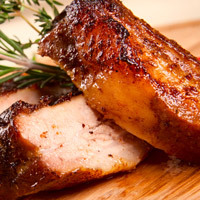 Lean meats like chicken breasts can benefit from a bacon layer – just wrap it up in bacon and roast. Add chopped bacon to salads and cooked vegetables for an extra oomph. Finally, another cool way to cook bacon is to make a bacon weave. Fat content of minced meat varies from very lean to reasonably fatty. Check the label for your mince fat content and go for 20% fat or higher. It will be cheaper than leaner versions and it will taste much better. Use it to make burgers, meatloaves or simply fry on its own with chopped vegetables. 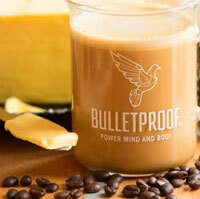 Bulletproof coffee is a branded coffee recipe with specific MCT oils and coffee beans. Inspired by the traditional Tibetan coffee with butter, it’s become hugely popular with Keto and Paleo dieters. If you don’t buy into the Bulletproof concept, you can still make your coffee very fatty and satisfying – just add butter, cream or coconut oil to taste. 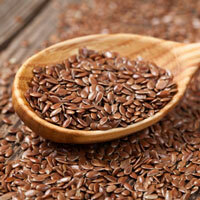 Flaxseeds (also known as linseeds) have a great nutritional profile. 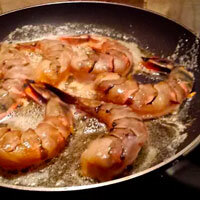 Add it to recipes and baked goodies for extra fat, protein and healthy omega oils. Because of its high fibre content, ground flax absorbs moisture, helping to make your dough more supple. Crumbliness is often a problem with low-carb baking (due to the lack of gluten), so every little helps. Cream or coconut milk make a great high-fat base for Keto smoothies and shakes. 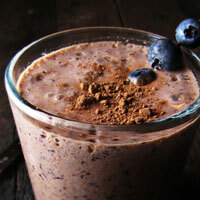 Add avocados, flaxseeds and unsweetened cocoa powder for even more fat. Sweeten with a sugar substitute. Eggs are super-nutritious and fantastic in all respects, except that you might get bored eventually. Think of eggs as a base for other ingredients. 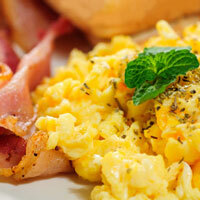 Load your scrambled eggs and omelettes with toppings like cheese, cold meats and veggies to add some variety. Bone marrow is basically pure fat. It is utterly delicious. You can get marrow bones from specialist butchers and farm shops. Roast them with a bit of salt and pepper for a scrumptious Keto treat. Olives are naturally high in fat, so make a good Keto snack on their own. 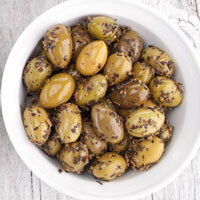 You can also take it further by making a tapenade – a paste from olives and olive oil. 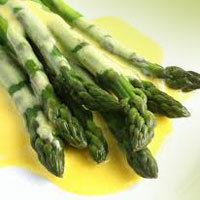 Hollandaise is the only classical French sauce that doesn’t include flour. 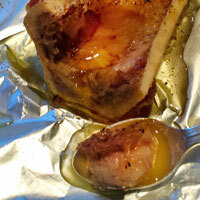 It is based on egg yolks and melted butter, making a perfect companion for Keto meals. Béarnaise is very similar but uses slightly different flavourings. Making these sauces is not super-easy, but mastering them is well worth the effort. Some vegetables are fantastic at guzzling fat. You can drown them in fat but they will just happily absorb it all and carry on. 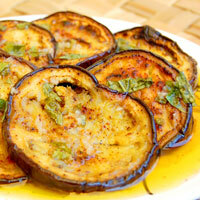 Aubergines (eggplants), mushrooms and artichokes are especially good at this. Do you miss potato crisps? 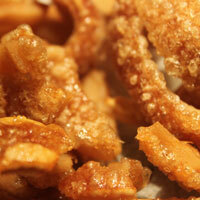 Try pork scratchings instead (pork rinds in USA). 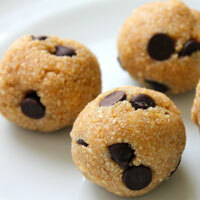 Perfect portable high-fat snack! 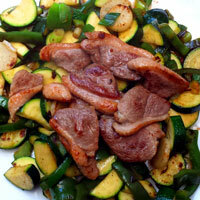 Unflavoured versions usually contain just pork, salt and pepper, with zero carbs. If buying flavoured variety, check the label for added sugar. Do you need more ideas for high-fat Keto snacks? Check out this amazing list – 120 ideas and recipes for Keto snacks. Great content, informative and well written.